How to Be Well is a unique handbook with everyday habits and practices you can deploy to live your best, healthiest, and happiest life. Frank Lipman, MD, a pioneer in both integrative and functional medicine, is the founder and director of Eleven Eleven Wellness Center in New York City, a New York Times best-selling author, and the creator of Be Well, a lifestyle brand which helps people achieve genuine and sustainable life changes. A leading international speaker on health and wellness, he has been featured in many top publications, including the New York Times, New York Magazine, Vogue and O, the Oprah Magazine, and has appeared on the TODAY show, Extra, and The Dr. Oz Show. Learn more at howtobewell.com. "Frank is my go to Wellness guy and he has solved every problem I've thrown his way, using his wisdom and his humor and his heart." “Dr. Lipman has done it again (and again). He always inspires me to be a better version of myself by making real lifestyle changes that stick. He educates and motivates by telling us how to get all the benefits of a wellness lifestyle. I’ll keep this one close by - everyone should!" "Can you imagine ONE pill that would take away sugar cravings, clear up skin, bring calmness and clarity, promote vitality, provide energy all day long and sleep all night long, make you happy, help prevent diabetes, heart disease and obesity, and taste great? 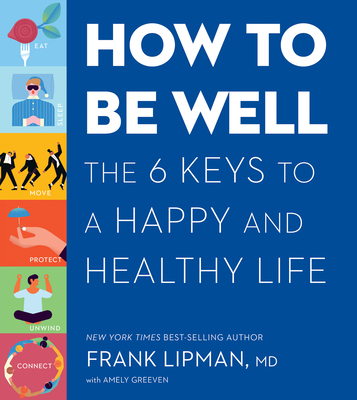 Frank’s book, How to be Well, is as close as we’ll ever get to that pill. And it tastes better."